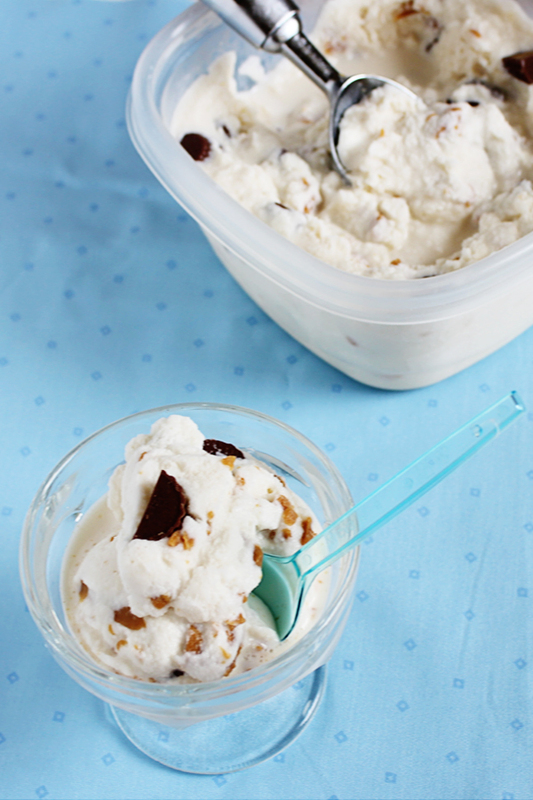 Cool down this summer with this quick, no-cook Peanut Butter Cup Ice Cream that is dotted with peanut butter cups and swirls of peanut butter. Last week for our anniversary we went out to dinner and despite being stuffed, we decided to finish off the night with some ice cream. We shared a scoop at a darling little ice cream shop around the corner from where my husband works, after minutes of gazing at all the flavors, we finally decided on the Edy’s Peanut Butter Cup ice cream. It turns out it was a fantastic choice, even our daughter loved it! Well today is another special day in our family, it’s my hubby’s birthday, the big 3-0. I always like to make him something extra special on this day, and this year I decided to make my own version of the peanut butter cup ice cream. This recipe is a quick, no-cook ice cream that is dotted with peanut butter cups and swirls of peanut butter. On a hot summer day, this treat is just what you need to cool you down; it’s smooth, creamy and delicious. Get your printable recipe card here, I hope you’ll enjoy! I want some!!! You always make the yummiest things!! My gosh, I would totally not share this! LOL. Pinned!